Baptism is a gift we can’t fully appreciate on this side of eternity. In the water, God’s Word joins us to Christ in a truly miraculous way. We become His and He becomes ours in a way that can’t be broken. Thank God for this wonderful gift! ISRAEL TRIP BIBLE STUDY—The study to prepare pilgrims for our Israel trip is open to all who'd like to learn more about the Old Testament history of Jesus' ancestral home. Join us to learn about Bethlehem, King David's hometown, following worship on Jan. 23 in the narthex. MARRIAGE RETREAT—Registration is now open for all couples who'd like to grow in their relationship by learning how to Get Connected, Feel Connected and Stay Connected Feb. 15-16 at the Comfort Inn, Avon. Cost of $175 includes materials, activities and meals. Family Counselor Nancy Eisenman, MSW, LCSW, will lead our retreat. Itinerary and sign-up are at the Welcome Center. For those who'd like to make this a get-away and spend the night at the hotel, a reduced rate is available. Registration is limited, so sign-up before the cost goes up to $195 on January 28. BIG GAME PARTY—You are invited to join us for the Big Game Party this year on Sunday, February 3 from 6-10 p.m. We will have traditional game day food, games in the narthex and gym, a special half-time performance from the youth Praise Team, and a room set-up for serious football-watching fans. This is a family friendly event, so invite your friends to come watch the game at Our Shepherd. NATIONAL LUTHERAN SCHOOLS WEEK & OSLS STAFF RECOGNITION—National Lutheran Schools Week provides nearly 2,000 preschools, elementary schools and high schools with the public opportunity to proclaim and celebrate God’s work among us in schools of The Lutheran Church—Missouri Synod. As this week approaches, we want to recognize the work of our school staff with a blessing during the 8 a.m. service on January 27. Blessing bags are in the narthex if you’d like to offer a note of encouragement or token of gratitude. OSLS ENROLLMENT—Open enrollment for the community has begun. Be sure to tell your friends and neighbors about us! Nicole Cook, Trudy Gierke, Lynda Pruett, Al & Marian Schafer, and Frances Wells. For all of our homebound members including Sigurd Zielke. For our active Armed Forces members: Andrew Pierson and Rex Rafferty. Ladies Circle Meeting, Jan. 17, 10 a.m.
GO Mission Event, Jan. 26, 10 a.m.-3 p.m.
OSLS Staff Recognition, Jan. 27, 8 a.m.
1 What shall we say then? Are we to continue in sin that grace may abound? 2 By no means! How can we who died to sin still live in it? 3 Do you not know that all of us who have been baptized into Christ Jesus were baptized into his death? 4 We were buried therefore with him by baptism into death, in order that, just as Christ was raised from the dead by the glory of the Father, we too might walk in newness of life. 5 For if we have been united with him in a death like his, we shall certainly be united with him in a resurrection like his. 6 We know that our old self was crucified with him in order that the body of sin might be brought to nothing, so that we would no longer be enslaved to sin. 7 For one who has died has been set free from sin. 8 Now if we have died with Christ, we believe that we will also live with him. 9 We know that Christ, being raised from the dead, will never die again; death no longer has dominion over him. 10 For the death he died he died to sin, once for all, but the life he lives he lives to God. 11 So you also must consider yourselves dead to sin and alive to God in Christ Jesus. 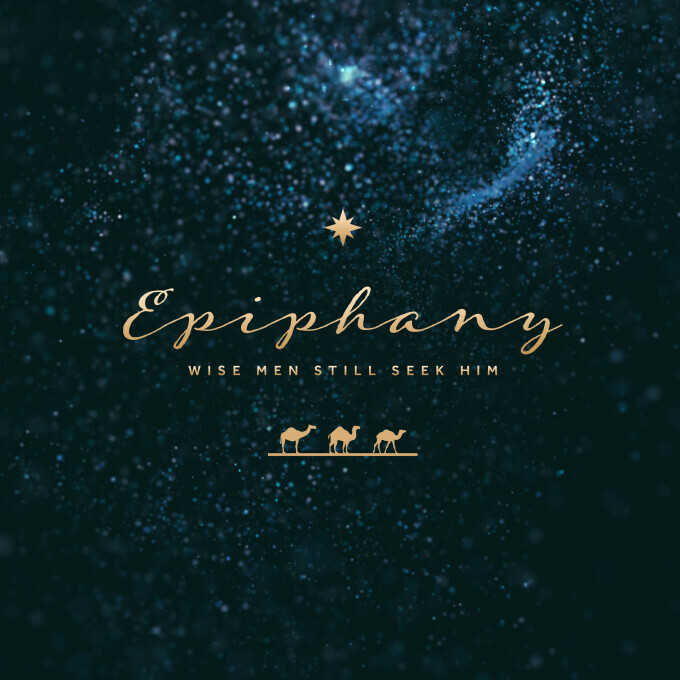 Epiphany is when we celebrate God’s revelation of Jesus, the Light of the world, to the gentile Magi. He guided them to Jesus by a bright star. They came from the east, from the area of Midian and Ephah. May God open our hearts, as He did theirs, to reveal Jesus as the Christ, their Savior and ours. CHURCH UN-DECORATING—Join us TODAY at 12 p.m. to un-decorate the campus. GO MISSION EVENT—The January mission event will once again be serving families at Riley Hospital’s Ronald McDonald house. Help prepare and serve a taco lunch on Jan. 26 from 10 a.m.-3 p.m. Be sure to sign-up at the Welcome Center. OSLS-Current school families and church members may begin our online re-enrollment process now! We offer a discount for those who complete their enrollment before March 23 – $125 enrollment fee. Beginning March 24, the enrollment fee increases to $150. The Kindergarten class is expected to be at capacity, so secure your child’s spot today! Open enrollment for the community begins on January 7. Nicole Cook, Trudy Gierke, Connie Hawk, Lynda Pruett, Al & Marian Schafer, and Frances Wells. For all of our homebound members including Judy Lehr. For our active Armed Forces members: Andrew Pierson and Rex Rafferty. New Member/Catechism Class, Jan. 6, 9:30 a.m.
Church un-decorating, Jan. 6, 12 p.m.
1 Arise, shine, for your light has come, and the glory of the Lord has risen upon you. 2 For behold, darkness shall cover the earth, and thick darkness the peoples; but the Lord will arise upon you, and his glory will be seen upon you. 3 And nations shall come to your light, and kings to the brightness of your rising. 4 Lift up your eyes all around, and see; they all gather together, they come to you; your sons shall come from afar, and your daughters shall be carried on the hip.5 Then you shall see and be radiant; your heart shall thrill and exult, because the abundance of the sea shall be turned to you, the wealth of the nations shall come to you. 6 A multitude of camels shall cover you, the young camels of Midian and Ephah; all those from Sheba shall come. They shall bring gold and frankincense, and shall bring good news, the praises of the Lord. 1For this reason I, Paul, a prisoner of Christ Jesus on behalf of you Gentiles— 2 assuming that you have heard of the stewardship of God's grace that was given to me for you, 3 how the mystery was made known to me by revelation, as I have written briefly. 4 When you read this, you can perceive my insight into the mystery of Christ, 5 which was not made known to the sons of men in other generations as it has now been revealed to his holy apostles and prophets by the Spirit. 6 This mystery is that the Gentiles are fellow heirs, members of the same body, and partakers of the promise in Christ Jesus through the gospel. 7 Of this gospel I was made a minister according to the gift of God's grace, which was given me by the working of his power. 8 To me, though I am the very least of all the saints, this grace was given, to preach to the Gentiles the unsearchable riches of Christ, 9 and to bring to light for everyone what is the plan of the mystery hidden for ages in God, who created all things, 10 so that through the church the manifold wisdom of God might now be made known to the rulers and authorities in the heavenly places. 11 This was according to the eternal purpose that he has realized in Christ Jesus our Lord, 12 in whom we have boldness and access with confidence through our faith in him. 1 Now after Jesus was born in Bethlehem of Judea in the days of Herod the king, behold, wise men from the east came to Jerusalem, 2 saying, “Where is he who has been born king of the Jews? For we saw his star when it rose and have come to worship him.” 3 When Herod the king heard this, he was troubled, and all Jerusalem with him; 4 and assembling all the chief priests and scribes of the people, he inquired of them where the Christ was to be born. 5 They told him, “In Bethlehem of Judea, for so it is written by the prophet: 6 “‘And you, O Bethlehem, in the land of Judah, are by no means least among the rulers of Judah; for from you shall come a ruler who will shepherd my people Israel.’” 7 Then Herod summoned the wise men secretly and ascertained from them what time the star had appeared. 8 And he sent them to Bethlehem, saying, “Go and search diligently for the child, and when you have found him, bring me word, that I too may come and worship him.”9 After listening to the king, they went on their way. And behold, the star that they had seen when it rose went before them until it came to rest over the place where the child was. 10 When they saw the star, they rejoiced exceedingly with great joy. 11 And going into the house, they saw the child with Mary his mother, and they fell down and worshiped him. Then, opening their treasures, they offered him gifts, gold and frankincense and myrrh. 12 And being warned in a dream not to return to Herod, they departed to their own country by another way.